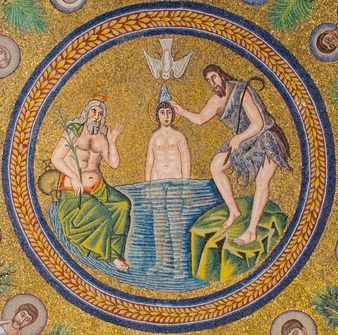 Eternal Father, who at the baptism of Jesus revealed him to be your Son, anointing him with the Holy Spirit: grant to us, who are born again by water and the Spirit, that we may be faithful to our calling as your adopted children; through Jesus Christ your Son our Lord, who is alive and reigns with you, in the unity of the Holy Spirit, one God, now and for ever. Amen. In the beginning God created the heavens and the earth. Now the earth was formless and empty, darkness was over the surface of the deep, and the Spirit of God was hovering over the waters. And God said, “Let there be light,” and there was light. God saw that the light was good, and he separated the light from the darkness. God called the light “day”, and the darkness he called “night”. And there was evening, and there was morning – the first day. Ascribe to the Lord, you powers of heaven, * ascribe to the Lord glory and strength. Ascribe to the Lord the honour due to his name; * worship the Lord in the beauty of holiness. The voice of the Lord is upon the waters; the God of glory thunders; * the Lord is upon the mighty waters. The voice of the Lord is mighty in operation; * the voice of the Lord is a glorious voice. He makes Lebanon skip like a calf * and Sirion like a young wild ox. The voice of the Lord splits the flash of lightning; the voice of the Lord shakes the wilderness; * the Lord shakes the wilderness of Kadesh. The Lord sits enthroned above the water flood; * the Lord sits enthroned as king for evermore. The Lord shall give strength to his people; * the Lord shall give his people the blessing of peace. While Apollos was in Corinth, Paul passed through the inland regions and came to Ephesus, where he found some disciples. He said to them, ‘Did you receive the Holy Spirit when you became believers?’ They replied, ‘No, we have not even heard that there is a Holy Spirit.’ Then he said, ‘Into what then were you baptized?’ They answered, ‘Into John’s baptism.’ Paul said, ‘John baptized with the baptism of repentance, telling the people to believe in the one who was to come after him, that is, in Jesus.’ On hearing this, they were baptized in the name of the Lord Jesus. When Paul had laid his hands on them, the Holy Spirit came upon them, and they spoke in tongues and prophesied – altogether there were about twelve of them. Jane Williams is well worth reading this week, which you can do here. Searching ‘nothingness’ will take you to page 20. 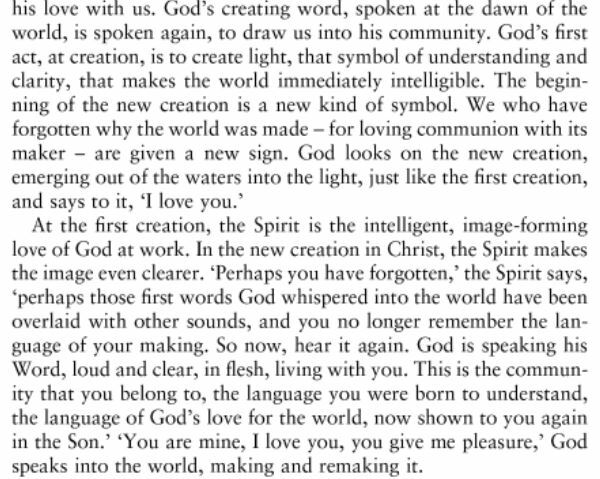 Lord, at the beginning of another human year we acknowledge once more that everything in our world was made by you, and without you was not anything made that was made. And we also acknowledge that you need our hands and our feet, our hearts, our minds and our wills to build your kingdom on earth. As you once began to build your Church on the rock of St Peter, a simple fisherman, so in our day you depend on us, the warp and weft of humanity. Make us worthy of this calling. Lord, renew us with your Spirit, that we may fulfil all that you wish for the world: in your mercy, hear our prayer. Lord, your love embraces all the powers of creation. Your voice rolls over the waters, your glory thunders over the oceans. Give us the steadinesss and skill to strive fearlessly with the energies that you have placed in our hands, that the wise use of atom and laser, of heat and light, may enable all that grows on this earth to flourish. You who offer stillness in the eye of the storm, give us we pray the blessing of your peace. As we are all united in the common bond of our baptism, help us, Lord, to break down the barriers that keep us apart. And, as you have loved us, help us to love those whom we live amongst. Teach us to delight in our differences, as much as those things we have in common. Teach us, in humility, to learn from each other. And teach us to bear with one another’s failings, as we hope they will bear with ours. Lord, look with mercy on those whose lives are bruised, who feel they are stranded in an arid desert, or whose hopes are quenched. We remember all who have lost confidence in life. We pray for the world-weary, the worn and the weak. Give them new life and hope through your life-giving, Holy Spirit so that, always immersed in your presence, they may feel buoyed up by the knowledge that underneath, supporting them always, are your everlasting arms. We commend to your love those who were close to you in this life, and are now closer still. May we at the last pass through the waters of death to life eternal with you. Good Work, Laura. Keep it up, the Church needs you! Thank-you for the encouragement, Father. Strange that whenever I weary a little on the journey, some kind person is prompted to send me a little word like this. Very energizing – thank-you!